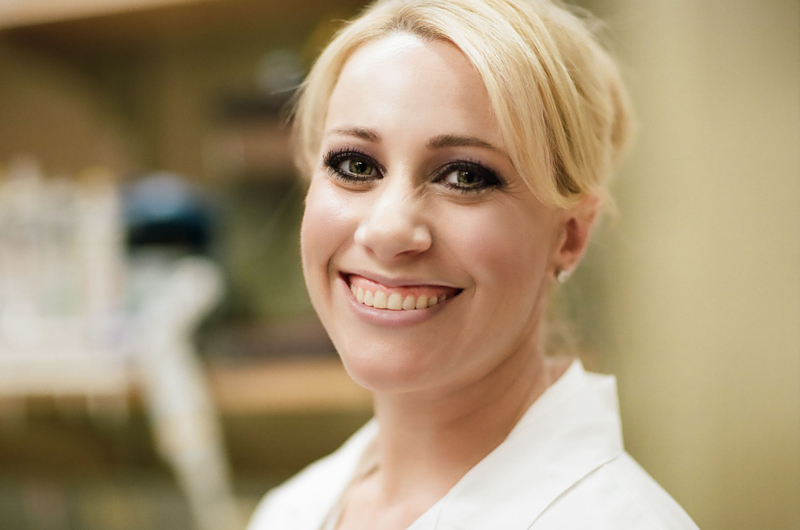 LA JOLLA—Salk Associate Professor Janelle Ayres has been named one of three winners of the Blavatnik National Awards for Young Scientists, one of the world’s largest unrestricted prizes for early career scientists. Ayres, the laureate in the life sciences category, will receive $250,000 for her pioneering research in physiology and the study of the how bacteria interact with humans. Ayres’ work is revolutionizing our understanding of host-pathogen interactions and has the potential to solve one of the greatest current public health threats: anti-microbial resistance. As a member of Salk’s NOMIS Center for Immunobiology and Microbial Pathogenesis, Ayres works at the intersection of immunology, metabolism and microbiology, studying how our bodies stay healthy during infections. She takes an innovative approach grounded in mathematical and evolutionary predictions to understand how bacteria have evolved ways to promote our health. She uses these discoveries to develop new therapies for treating diseases. Ayres’ groundbreaking research on host-pathogen interactions is redefining our definition of health. In pivotal work, she discovered that microbes have evolved mechanisms to promote the health of the host to support their own survival, revealing a beneficial role for microbes in the maintenance of host health. Her revelation of an entirely new set of defense mechanisms likely will lead to novel therapies that bacteria won’t be able to evolve resistance to (unlike antibiotics). Ultimately, by leveraging those damage-control mechanisms, Ayres aims to develop effective treatments for infectious and noninfectious diseases, such as pathologies associated with cancer and aging. Ayres, who is also Helen McLoraine Developmental Chair at Salk, was selected as one of 31 finalists from among 286 outstanding faculty-rank researchers age 42 or younger nominated by 146 institutions across 42 states. She is one of three Blavatnik national laureates—one each in the categories of life sciences, chemistry, and physical sciences and engineering. The 2018 Blavatnik national laureates and finalists will be honored at an award ceremony on Monday, September 24, 2018, at the American Museum of Natural History in New York City. The Blavatnik Awards, established by the Blavatnik Family Foundation in the United States in 2007 and administered by the New York Academy of Sciences, began by identifying outstanding scientific talent in New York, New Jersey and Connecticut. The Blavatnik National Awards were inaugurated in 2014 and, in 2018, the awards were expanded to include young scientists in the United Kingdom and Israel. By the close of 2018, the Blavatnik Awards will have conferred prizes totaling $6.6 million, honoring 271 outstanding young scientists and engineers.